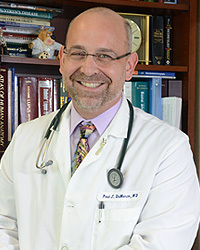 Paul J. DeMarco, M.D. earned his undergraduate degree from Georgetown University, Washington, DC in 1986; he then earned his medical degree in 1990 from Georgetown University School of Medicine where he received a Naval Health Professional Scholarship. After a year of Internship in Family Practice at the Naval Hospital Camp Pendleton, CA, he served the country as the Medical Department Head aboard the USS Denver, an amphibious transport dock, from 1991-1993. He returned to training in Internal Medicine at Naval Medical Center San Diego, CA until 1996 and then went on to complete his fellowship training in Rheumatology in 1998 at the Scripps Clinic and Research Foundation in La Jolla, CA where he was selected to the position of Chief Fellow. Upon completion of his fellowship training, Dr. DeMarco returned to the Naval Medical Center, San Diego, where he had appointments in Internal Medicine and Pediatrics, and was on staff at Children’s Hospital in San Diego as a consulting physician. Dr. DeMarco completed his military service in 2001 as the head of Rheumatology at Naval Medical Center San Diego, and then moved to the Marshfield Clinic, Wausau, WI where he treated adults and children with rheumatic diseases, participated in research and taught for the University of Wisconsin-Madison Medical School. Dr. DeMarco moved to the DC metropolitan area in 2003 to work on the teaching faculty at the Washington Hospital Center and was co-director of the Rheumatology Fellowship Program. With his transition to Arthritis and Rheumatism Associates, he became the Medical Director for the Clinical Trials Department and remains involved in research. He remains actively involved in clinical care, research and teaching. He has published and lectured in most aspects of rheumatology, but has particular interest in connective tissue diseases in adults and children. He is an Associate Clinical Professor of Medicine at Georgetown University School of Medicine, teaching medical students and rheumatology fellows. He is actively involved in applications of diagnostic and interventional musculoskeletal ultrasound in rheumatology, and has lectured nationally on this topic. He is among the first physicians in the country to achieve certification from the American College of Rheumatology in Rheumatologic Musculoskeletal Ultrasonography (RhMSUS). Dr. DeMarco is a Board Certified Rheumatologist, a Fellow of the American College of Physicians, a Fellow of the American College of Rheumatology and a member of the American Institute of Ultrasound in Medicine. Accepting patients at our Wheaton and Frederick facility. “I was very pleased with Dr. DeMarco and the time he spent with me. He was not in a hurry and did a very thorough evaluation.” ~ Vincent L.